This is a first for this blog: a guest blogger appearing on both Friend Friday AND From the Office of the Future of Reading. Today, Sashi Kaufman wears her writer's hat. Later in the month, she'll share her insights while attired in her teacher chapeau. Double dipping! I love it. 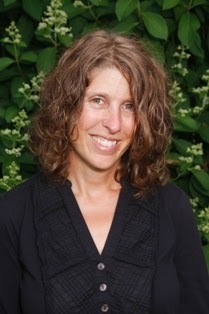 Sashi is an English and science teacher who lives in Westbrook, Maine with her husband and daughter. The Other Way Around is her first YA novel. She believes ice cream is a vitamin and is also an amateur trash picker. A little bit about how I found The Other Way Around. First of all, this was not my book’s original title. Originally I called the book Go West –which I thought was a very clever play on the road trip element and my main character’s name; Andrew West. Then, because the book was about a sixteen year old boy who runs away with a group of dumpster-diving, street-performing anarchists, the book was called The Freegans. But neither of those sat quite right with my editor –the super amazing Andrew Karre. At the time I was bummed out. I liked both of the titles my agent and I had come up with and none of his suggestions were working for me. I feared I was going to have a book with a title I was unhappy with. My editor left it up to me to find something we could agree on. I went back into the book and at the end of one chapter found this line. “I feel closer to the world in a good way, on the inside looking out instead of the other way around.” Andrew is the consummate observer. He watches but rarely makes an emotional commitment to others or even himself. This sentence was part of his reflection after an intense conversation with a girl he’s realizing he cares about. So the title worked on an emotional level and it also worked on a physical level. 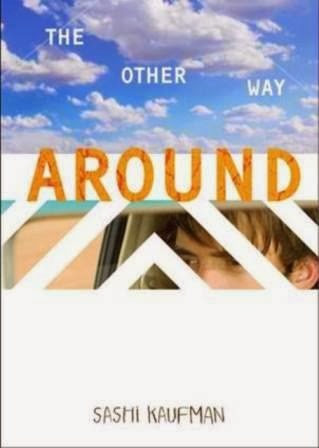 The book is a road trip which takes the characters on a roundabout journey across the Southern U.S. The title is also about the journey of growing up and discovering what kind of an adult you’re going to be. I teach eighth grade and so I see my students at the beginning of this journey as they’re just starting to think about themselves as adults or potential adults. Middle school can be kind of a sheltered insular time in life no matter where you live –but particularly so if you live in a smallish town in Maine. I try as much as possible to impart to my students that there are as many ways to be an adult as there are adults. But as their teacher, I know they tune out a lot of what I say –waiting for the lines, “And the homework for tonight is….” But they always listen to stories. Never is my class more captivated then when I change the tone of my voice to something slightly more informal and tell them some weird semi-related anecdote about my life. I don’t do it often –I swear I’m not one of those over-sharing teachers who make me cringe. The point is not about me. It’s about a story. When I wrote The Other Way Around I wanted to tell a story about a teenager taken far out of his comfort zone and away from what was familiar. I wanted him to be skeptical but curious. And I wanted that character to draw kids in the way I might imagine it would draw my students in –feeling safe, cautious but also curious. Stories have an incredible power to show us other ways to be and think and to ultimately decide in what ways we might incorporate new ideas into our own narratives – to help us find our own way around. Sashi, I'm so intrigued. I know I'm not the only one that's going to run right out and get your book. . .which just came out on March 1! I'm also going to follow you on twitter, too. Thank you for this reminder of the power of story. This sounds like an intriguing book that boys especially will enjoy reading.